It apparently took the publisher's money, staff, and creative direction to get the game to market. Apparently, It's not just employees that have been treated badly by Team Bondi: LA Noire publisher Rockstar is supposedly not all that impressed with the studio either. So much so, in fact, that it apparently doesn't want to work with Team Bondi in the future. According to sources within the studio, LA Noire's success has as much to do with Rockstar steering the project away from disaster as anything that anything that Team Bondi did. Had it not been for Rockstar's financial support, the source said, Team Bondi would have closed down years ago. Rockstar also contributed staff to the project - which was apparently sorely lacking animators, which is said to be the reason the open world is a so spartan - and overruled a number of the more outrageous ideas the Team Bondi management came up with. This is what is said to have soured the relationship between Team Bondi and Rockstar: Rockstar - which was once eyeing the studio as a possible "Rockstar Sydney" - was unhappy with Team Bondi's direction, while Team Bondi was unhappy with the amount of creative control the publisher was taking. "Every dog has its day and there's going to be hell to pay for this one," studio boss Brendan McNamara wrote in an email mistakenly sent out to everyone at Team Bondi. "I'll never forget being treated like an absolute **** by these people." McNamara claimed that he was referring to negative comments on news articles, but according to the source, he was really referring to Rockstar, after the publisher left the Team Bondi logo off an announcement showing off a new LA Noire logo in October of last year. 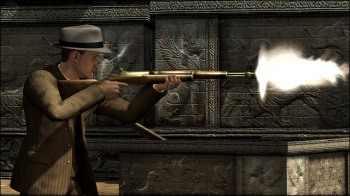 McNamara has promised big things for LA Noire 2, but it sounds like Team Bondi will have something of an uphill struggle getting another game out the door. If even half the claims from the whistleblowers - which you can read in more detail here - are true, then you have a studio that treats its staff exceptionally poorly and is run rather poorly. That's not a particularly attractive proposition for a publisher.